I had a lot of things I could have been doing tonight while my family was off doing other things. But I mostly just sat around, looking at profiles of people on my friends list. There are people that I will never ever delete because I’ll never be able to get them back on my list. It’s funny, but when things are quiet and I’m alone in SL, my thoughts always drift back to Cen. I still miss her. It’s been 6 years now since she left SL and I still miss her. I miss the easy friendship we had. We were always in IM with each other when we were online, no matter what we were doing. I think we probably saw each other if not daily, then every other day. It was easy and fun and I miss it. I wonder what she would think of all the changes in SL over the past 6 years. When she left, mesh was still 2 years away from making its appearance on the grid. Gacha was something silly you stumbled upon in small Japanese stores. Stores happily gave gifts to not just their free group members, but to everyone by just placing a box at the front door. Our whole group of friends were still strong and together. Things have changed a lot. But, that’s the way of the world. Things change, people leave. I don’t even know that we’d still be friends if she had stayed. I know my priorities in SL definitely changed over time and I’m sure hers would have as well. It happens. But if she ever came back to SL, I’d hope she’d look me up. It’s late and I think I’ve reached Grey’s Anatomy saturation point [I’ve been marathon watching for days], so I think it’s bedtime. Day 147 – It must have been good, but I lost it somehow. I don’t follow a lot of blogs. I mean, I DO follow them, but I don’t sign up Google Reader follow them, you know? I just use my blogrolls or bookmarks or look at new posts on feeds and plurk. But there are a few that I have put in my Google reader. Did you know that even if they delete the blog, they remain in your reader? I was bored and glancing through tonight and came across Cen’s old blog. And I sat there and I read every post. I don’t really talk about her much anymore. She left SL in early 2009 and well, 3 years is a long time to be holding on to something, right? But there are times when I really miss her still. Reading her blog, I can see how hard things were becoming for her towards the end, but I guess I’d always thought if she left being Cen, she’d become someone else. After all, she had done it before. That was part of our original bond – we were both “replacements.” Of course, for all I know, she did start over and if so, I know she’s out there having fun and laughing and enjoying SLife as she did before. But I miss her. I miss our crazy adventures. I miss our long chats about our lives, both first and second. 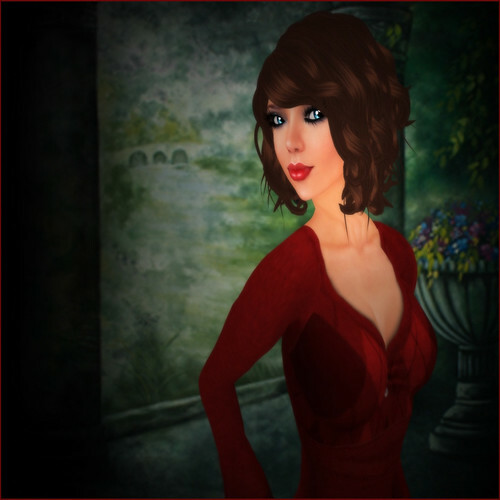 She was one of the better listeners I’ve encountered in SL, which meant a lot to me because I’m usually the listener. When we’d chat, I knew I had pretty much her full attention, as she had mine. I miss how we could sit quietly with each other for hours, barely talking, but there was nothing uncomfortable about it. I know that things change. I know that there’s the chance that our friendship wouldn’t have lasted. We might have eventually had a falling out, or just drifted apart and became people who were just on each others’ friends lists and spoke once in a great while. Or maybe we’d still be close, running around and laughing, exploring the grid with our men or our friends. Ok, I’m marginally better today, since I can’t seem to hold a grudge or stay too angry for long. lol RLBF did something yesterday that just…ugh. If I were a different sort of person, I probably would have thrown a shoe at him. As it was, I just stayed quiet for the rest of the day, which is probably scarier to him than if I’d just thrown the shoe. So last weekend my friend Sophia asked me if I wanted a picture done in my new skin. Her husband, Skyhawke Sodwind, does marvelous photos! They bring out the best in everyone, and aren’t post-processed to death like so many SL photos end up being. Of course I agreed right away! LOL Tuesday night, I headed over. Cen and later Brody joined me in bugging the Harlow-Sodwinds. 😉 Ok, so we probably didn’t bug them TOO much. 🙂 What came out were 2 gorgeous photos of me, and fabulous pictures of Cen and me and Brody and me. The picture of Cen and me was put together with separate pictures because we couldn’t find a 2 person pose that looked good with both of us. And I’m impressed with the shot of Brody and me because in the studio, my arm was totally going through his shoulder. LOL If you look at my hair in that picture, it’s all feathered out and pretty, too. If I wasn’t so adamant about always wearing prim lashes, Sky would have given me lashes! But well, it’s rare I’m ever without prim lashes, so he didn’t get to do that for me. Big thanks to Sophia, who has truly been my angel the past few months, for asking us if we wanted to come in for photos, and to Skyhawke, who brings out the best in people without totally changing how they look. You both are awesome!!! Dress Me Up Challenge – Suggestion 4 – And a recipe!! Yay, back to the fun stuff!! 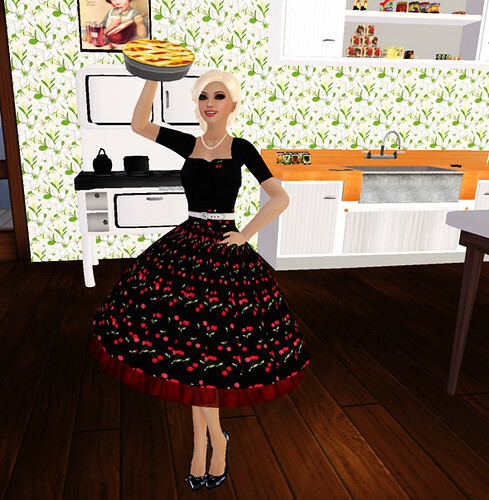 Suggestion #4 for the Dress Up Challenge comes from my SL bestie, Cen, who wanted to see me as a traditional housewife. Believe me, that really IS out of my comfort zone! LOL!! I immediately knew I wanted to wear the cute Cherry dress from Ivalde for this challenge. I think it worked out quite well!! C’mon over, pie is ready! I paired up this cute dress with some pearls I found on XStreetSL, the pinup heels from Stiletto Moody [you better believe I’m getting use out of those shoes!!! ], and Tyra hair from ETD. Oh, that pie was a freebie on XStreetSL. The biggest problem to this whole challenge was figuring out where I could go to take pictures. Our home doesn’t really have a kitchen [we have a sink, some counters, and a table], and as far as I know, no one else on the island has a kitchen either. We kind of just wait for Tymmerie’s parties to bring a take home plate, I think. 😉 But then I remembered the simply wonderful Vignette sim. I knew there was a house there with a cute little kitchen, so I gathered up my skirts and ran over! The best part about taking pictures at Vignette is that you can drop posestands. Oh it just makes it so much more easier! Thank you, Cen, for making me look pretty and feminine for once!! 🙂 And because Cen also threw down another challenge where we share recipes, I leave you with this awesome apple pie recipe! So much went on today! First of all, sympathies to those who were using their Open Space sims for the intended purpose and are now about to be screwed. It’s as the old saying goes – one bad apple can spoil the bunch. BUT – don’t get all crazy just yet. You all know as well as I do that LL has made some statement on the blog about what they plan on doing and then they change things around later. Hello, ad farming? Don’t plan on the sky falling just yet, is what I suggest. Cen and I decided to go out on one of our random adventures tonight. Well, it initially started out as just going to Zaara to get some jeans. 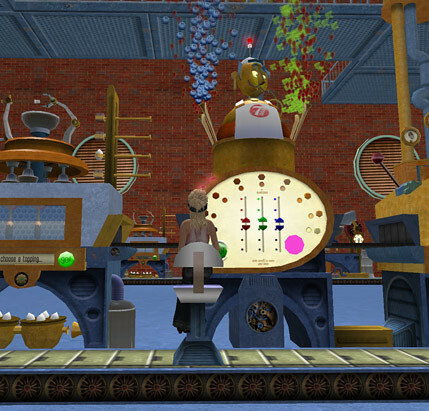 But after that we headed over to Dreaming Alice to look around, and then we decided to walk around the sim. There were stores there that we’d never heard of before in our lives. LOL By the 3rd one, we decided to be on that sim you basically had to be an unknown. The funniest thing was probably this little hair store we wandered into. The hair was not our style, but it might be for someone else. Then we took a little rest in a gypsy trailer thing. After we got bored there, Cen had the idea to check the Showcase listings and we ended up at this SUPER cute place called 7 Days Magic Bakery. Oh my gosh, you guys. You HAVE to go see this place. It’s not just this amazing build that will wow you, but it’s just….CUTE! It helps if you have your sound on because sometimes things talk to you, and the little background music while they talk to you is just adorable. You get to eat things and then you get to MAKE your own food! It’s so fun!!! Take a look at some of the pictures. It was just too fun. We kept running back to the machines to make more food. LOL If you’re looking for a cute way to spend some time that doesn’t involve shopping and hunts or going to some club, I DEFINITELY recommend this place!!! Combined with an awesome long conversation I had earlier with one of my favorite people in the whole entire world, and the fact that I got new ETD hair, Monday was a pretty great day. 🙂 But now I need some sleep so I can see what Tuesday holds! So after I plurked that people aren’t blogging enough and I have nothing new to read, Cen threw down a challenge that from now until Sunday, we all have to post 2 comments a day to blogs, and one should be a blog where we’ve never commented before. I’ve done my 2 for today, but I can’t say that I did them to blogs I’ve never posted to before. This challenge is actually going to be really hard for me. As much as I write, I STINK at commenting. When people plurkmote their blog posts, I am more likely to comment in their plurk. Or I just talk to them in world about what they wrote. Another bad thing is my not-so-secret guilt in that I also stink at reading blogs. If you’re on my blogroll, I’m reading you usually. If you’re not, then you sure as heck need to tell me you’re blogging, because I might not even know. LOL A lot of the time, I go to Cen’s blog and look at her blogroll, since it seems to update more quickly than mine does for some reason. Once in a while I see a blog there that I check out, but more often than not, I stick to the same ones because those are the people I feel a bit closer to. But, I like a challenge, so I will try. The big problem is that I can’t remember where I’ve posted and where I haven’t. And I usually don’t have a LOT to say in response to blog posts. So if you get a comment from me and it’s lame… yeah, sorry about that. I was laying in bed last night thinking about Cen’s post on invisible friendships. Go read it if you haven’t already and then come back. I’ll wait. I was thinking that most of my friendships in SL are invisible ones. There are VERY few people that I see on a regular basis. I see Cen, of course, but there are many people that I consider friends that I only see at the Wednesday parties, or maybe possibly if I bump into them when I’m out shopping. There are people on my friends list that I only IM and have met maybe once or twice in world. There are people in my group that aren’t even on my friends list. And that got me thinking. Why am I such a hermit? LOL It’s not like in the real world where I think the way I look keeps me from fitting in with people. 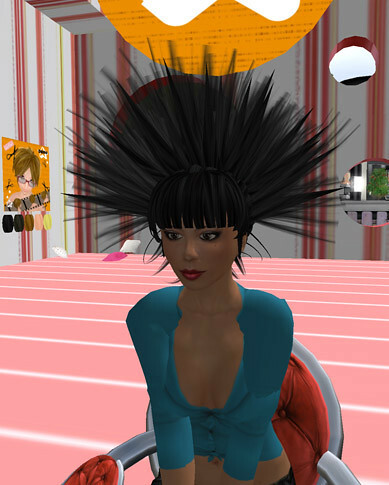 I know that as far as SL avatars go, I’m nice looking. It’s not my clothes, because although many of them are freebies, I can keep up with the Armidi crowd as well as anyone else. It’s not even that I think I’m dumb, because I know I can keep up with any conversation really. It all boils down to one thing. I am, just like in my real life, really stupidly shy. I know what people are probably thinking. How can you be shy? You help newbies. You DJ and people can hear your voice. You’re a blogger, for pete’s sake!! I know, I know, I know. I am a big mass of insecurity, which would probably surprise most people. I always think my problems are less important than others. I always think that other people are much busier than I am. I always think that I’m going to bother someone. Even when my friends do IM me, there’s always that tiny thought that makes me wonder if it’s because they wanted to IM me to chat, or if they felt sorry for me. Anyway…those are the thoughts running through my head today. I have a few hours to myself this afternoon, so I’m going to clean my RL house. Cleaning my SL home is always so easy. This RL cleaning stuff is not fun.